This is a copy of the abstract that forms the presentation that I will be doing on 4 June 2011 at the North American Society for Sport Management Conference in London, Canada. The NBA Finals series features the winners of the Eastern Conference taking on the Western Conference champion in a best-of-seven-games format. This series takes place each June. This study compared announcer discourse surrounding the 2008 NBA finals based on the race of the player: black or other. This study builds and adds to the existing body of knowledge regarding media bias during sporting events (e.g., Alabarces, Tomlinson, & Young, 2001; Billings & Eastman, 2002; Larson amp; Rivenburgh, 1991; Tudor, 1992). While a wide body of literature around race and sport exists, this study looks at a discrete event not often studied, a National Basketball Association Finals series, to analyze and evaluate the frames employed when commenting on the racial origins of the competing players. This study sought to uncover how the concept of race was portrayed by commentators during the broadcast of the finals. The theoretical framework that this study employs is agenda-setting. McCombs and Shaw (1972) noted that the media play an important role in the “shaping of … reality” (p. 176). Entman (1993) comments that the amount of coverage an issue receives is indicative of its importance, which aligns with Cohen’s (1963) maxim that the press “may not be successful much of the time in telling people what to think, but it is stunningly successful in telling its readers [and viewers] what to think about [original emphasis]” (p. 13). Through framing and scripting the coverage of an event, the media are able to set an agenda that its announcers will follow to ensure that its encoded discourse is correctly identified and decoded by viewers. This study seeks to uncover how the portrayals of race are framed by the American Broadcasting Corporation during the 2008 NBA Finals, which will uncover the agenda-setting function of the media. In particular, this study breaks ground in analysing a finals-series based around the concept of ethnicity. Often, global events, such as the Olympic Games, Commonwealth Games, and various sporting world cups are featured in media analyses focusing on bias of race, nationality, and gender. However, annual events, such as league finals or various sporting world cups are less often the site for analysis. Furthermore, the mediation of an audience and cultural influence of viewers may be more salient as these events are on television more often than an Olympic Games or world cups, such football/soccer. Thus, there might be a more sustained and continued mediation of viewers through broadcast discourse. All six of the 2008 NBA Finals games featuring the Los Angeles Lakers and the Boston Celtics were included in the sample for investigation. A content analysis was conducted based on the ABC’s live telecasts of the series. Only ABC employee discourse was included in the study. Analyzing a finals series allowed for the study of frames and the change that scripts may undergo as there is at lease one day between each game. Thus, the ABC can alter its series frame to cater for any changes in the series. In this study, each game was transcribed verbatim. Then, the transcription sheets were coded using a fourteen category taxonomy, which was used to record (a) the announcer uttering the phrase, (b) the race of the player, and (c) the resultant descriptor code. In addition, 20% of each game was coded by a second trained researcher to ensure inter-coder reliability, which was conducted using Holsti’s (1969) coefficient of reliability. Inter-coder reliability exceeded 86% for each game, indicating a good level of reliability among the two trained coders. The fourteen categories were: (a) athleticism, (b) appearance/looks, (c) background, (d) motivation, (e) skill, (f) history, (g) work ethos, (h) leadership, (i) mentality/composure, (j) creativity, (k) speed, (l) experience, (m) negative descriptors, and (n) positive descriptors. Overall, there were 1519 total comments in this analysis. Of this total, 1288 or 84.79% were about black players, while the remaining 231 or 15.21% were discussing players of other races. These data were analysed using two expected scores: overall game commentary and player percentage. Thus, in the overall game commentary, the expected scores were 84.79% and 15.21%. In the third analysis, the expected scores were 73.33% and 26.67%, as 22 of the 30 players were black. In the analysis at the overall percentage of commentary, which was 84.79% for black players and 15.21% for other ethnicities, there were two significant chi-square results. These were: leadership (df = 1, n = 80) = 11.00, p < .001 and negative descriptors (df = 1, n = 135) = 82.55, p < .001. In the second analysis of the 2008 NBA finals based on ethnicity, player participation ratios were used. These ratios represented the overall participation of this series, as 22 of the 30 players were black. At these expected scores, there were eight significant chi-square results, which were: background (df = 1, n = 214) = 17.51, p < .001; motivation (df = 1, n = 51) = 11.27, p < .001; skill (df = 1, n = 208) = 30.93, p < .001; history (df = 1, n = 246) = 32.61, p < .001; leadership (df = 1, n = 80) = 26.43, p < .001; mentality (df = 1, n = 157) = 8.21, p < .001; negative descriptors (df = 1, n = 35) = 15.143, p < .001; and positive descriptors (df = 1, n = 336) = 16.18, p < .001. This study was successful in uncovering that announcer discourse overwhelmingly favored black players. The ratio of commentary between black and other players was 5.6:1. Thus, the coverage of the NBA Finals was framed by the ABC to feature black players more in the commentary. In addition, black players received an unequal distribution of comments as this group represented 73.33% of all players but received 84.79% of commentary. Therefore, the ABC set its broadcast agenda to favor black players and set an agenda through the framing of its telecast to ensure the audience decoded broadcast discourse in the manner intended (Hall, 1973; McCombs & Shaw, 1972). Furthermore, black players were significantly portrayed as more effective leaders. In addition, more negative comments were provided to this group. Thus, players of other races were characterised less negatively. The results of this study underscore the fact that black athletes received far more comments than expected, based on commentary percentage, but it was found that this group was described more negatively. Thus, viewers may have been provided with a skewed view of this group, which aligns with Billings and Tambosi’s (2004) notion that television networks have the ability to “culturally influence perceptions” of reality. You may have been wondering why my banner picture was of a camera with small thumbnail photos hanging from it. Well, the reason for this is because of my research. My research interests are in the field of sport media. In particular, I look at the sport/media complex (Jhally, 2006); that is, the symbiotic relationship wherein sport and the media have a co-dependency for their content and financial viability. Put another way, neither industry can survive without the other. The media need sport and sport needs the media. The media serve to foster communication between a media organisation and the general public, which consumes it. Thus, a television networks’ main goal is to draw viewers to commercial messages of the broadcaster. This enables a broadcaster to sell advertising time to sponsors and advertising companies at a premium price. Thus, “programs are commercials for commercials” (Altheide & Snow, 1978, p. 190) as sport programmers integrate commercial messages in a variety of seditious ways into the actual program content. Further, Whannel (1981) suggested that the media typically personalise sport, even in team settings, by creating several “hero” scripts that attempt to predict potential participants who will be the “hero”. During the game, these scripts are confirmed or refuted. Much has also been written about discourse and its effects on everyday life. Allan (1998) noted that there should be an agreement between the images on television and the coinciding commentator discourse with the life experiences of the viewer, which are related to the scripting and framing of a broadcast (Goffman, 1986). Thus, what the viewer sees on television should also match the spoken word of the announcers or commentators. Here is the image in full. The reason for the choice of this photograph is because the camerawomen has thumbnail pictures of each player from both teams. The cameraperson wears headphones to hear what the on-air announcers are saying. 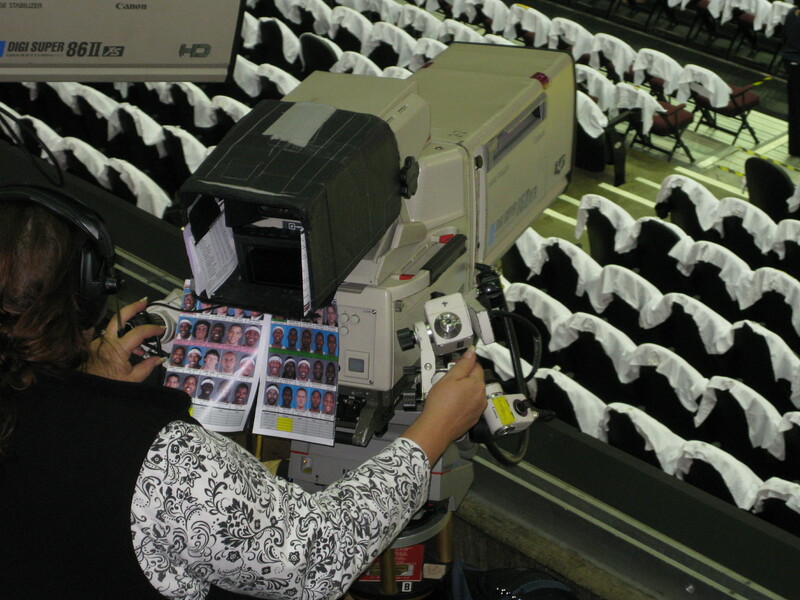 That way, the cameraperson can focus the visual images on the player who is being described. Then, there is a symmetry between the spoken and visual discourse for the viewer watching at home. Olan Scott, PhD is an Assistant Professor at University of Canberra in the Faculty of Health. Several courses I teach are: Sport Marketing, Sport Management and Development, and Sport Venues and Events. In my research, I explore the intersection of sport, business, and the media (print, electronic, and social). I have published academic articles in Sport Management Review, First Monday, International Review for the Sociology of Sport, Communication & Sport, International Journal of Sport Communication, among other. Further, I have several other articles either in review or in press in these and other journals. A full CV is available here. My research has been presented at many domestic and international conferences, such as North American Society for Sport Management, European Association for Sport Management, North American Society for the Sociology of Sport, Sport Marketing Association, and Sport Management Association of Australia and New Zealand. Thanks for visiting olanscott.com. Feel free to drop me a line or leave a comment! Lastly, you can comment on my blog posts as well! I look foward to hearing from you!